Velvet Sky was a South African low-cost carrier which was flying to Durban, Cape Town, Johannesburg and Port Elizabeth. Judge Philip Nkosi orders the final liquidation of Velvet Sky, dismissing an attempt for another adjournment. Employees of Velvet Sky, take their grievances to the Labour Court: "We have been lied to about payment for our salaries and we are going to file for liquidation of Velvet Key Airlines at the Labour Court as a means to get our (monies) out of them. We will not have to pay the attorney up front, but in the event of us winning the case, the attorney will take 10% of the payment. If they are liquidated, we will be the first ones to get paid before any other supplier." according to an internal memo The New Age has seen. The Civil Aviation Authority of South Africa temporarily suspends Velvet Sky airline's operating certificate. According to reports by the SABC, Velvet Sky have started laying off staff. BP's liquidation application is due to be heard before the Pietermaritzburg High Court, but Umzamo Transport Services, which is owed some R4m by Velvet Sky, launches an application to draw up a business rescue plan to save Velvet Sky. BP & Velvet Sky agree that the liquidation application be adjourned indefinitely, and Judge Kobus Booysens gives Umzamo Transport Services until 10 April 2012 to file supplementary papers in support of its application (if supplementary papers are not filed by 10 April 2012 BP will relaunch its liquidation application). Velvet Sky airline suspends its flights from the 28th February until the 4th of March 2012. "The board is confident that the long-term outlook for Velvet Sky remains positive and that current developments will significantly improve Velvet Sky’s position. The suspension of flights will allow the company time to reconstitute its board and balance sheet and realign its short-term strategy. It will also allow the company time to properly resolve disputes with certain suppliers and service providers." said Excalibur Aerospace chairman, Stephen Nthite. BP applies to the High Court for the provisional liquidation of Velvet Sky, which allegedly owes BP R29m for avgas. 2 Velvet Sky flights (JNB-CPT & JNB-DUR) were delayed as a result of not having paid South African Airways Technical and other service providers including Shell service fees. On the 23rd Feb 2012 further flights were delayed when SAA Technical wouldn't conduct maintenance until it was paid. Velvet Sky purchases 2 DC9 aircraft, one of which previously belonged to Tokyo Sexwale's family. The 2 aircraft cost R4.6m. Velvet will be using the aircraft in its new luxury VIP charter division. “It is a logical expansion of what we are currently doing. Since inception, we’ve established a footprint of operational capability, and this opportunity came our way. The aircraft were a good price, and we have had a significant number of inquiries about this kind of operation in the last few months. There is a lot of demand for VIP charter type operations into Africa”. said the Chief Operating Officer of Velvet Sky, Gary Webb. Stephen Nthite, Velvet Chairman, said that: "We have cancelled flights to Polokwane and intend to cancel our agreement with GAAL. Velvet requested GAAL on numerous occasions to clarify with the taxpaying public and our competitors how we got the concessions and explain the process followed so that these accusations of wrong doing can stop. Nothing was done by GAAL. We felt the route, the least profitable and sometimes loss making, was not worth the damage to our brand." Velvet Sky commences Port Elizabeth to Durban and Cape Town to Port Elizabeth flights. Velvet Sky commences Cape Town to Durban flights. Velvet Sky commences Durban to Port Elizabeth, Port Elizabeth to Cape Town and Durban to Cape Town flights. Velvet Sky begins flights between Johannesburg and Polokwane on Sundays, Mondays, Wednesdays and Fridays. Velvet Sky takes delivery of an additional 2 Boeing 737-300 aircraft, previously operated by Shenzhen Airlines in China, and were flown to South Africa via Sri-Lanka and the Seychelles. Before flying they are scheduled for a re-registration procedure, which involves extensive checks in conjunction with the SA Civil Aviation Authority and SAA Technical. There will also be an overhaul of the interior as well as a visit to the spray shop in order to convert them to the Velvet Sky livery. The procedure should be completed within a 5 week period. They will be offered in a 144 seat capacity configuration that will augment and increase the regularity of existing routes. Velvet Sky tickets can now be purchased at all Shoprite Money Market Counters and Computicket flights outlets. Macdonald Holdings, the majority owner of Velvet Sky airline, sells its stake to Excalibur Aerospace, with its Chairman, Cecil Reddy, saying: "Macdonald Holdings has identified international opportunities which it wishes to pursue in the short to medium-term. We place great emphasis on skills development and training; and we must deploy our hard-won expertise efficiently in order to grow our primary interests globally. We are selling our stake in Velvet Sky to Excalibur Aerospace who will no doubt continue to grow the business through their service-oriented approach, expansion plans into Africa and commitment to providing affordable air travel to South African commuters...It took us 2½ years to set up, it gave us trouble in the first few weeks but after we’ve nurtured it, it’ll be ready to play in the big league." Excalibur Aerospace plans to add 3 planes to the Velvet Sky fleet in the next year. The Chairman of Excalibur Aerospace, Stephen Nthite (a lawyer by training), said: "We have key partners in the aviation industry that we plan to leverage off as we implement our aggressive expansion model. We are very excited about acquiring Velvet Sky as it fits in well with our plans to enter the aviation industry in the SADC region. Excalibur aims to expand the Velvet Sky fleet by three additional aircraft, to be introduced over the next 12 months. The first of which will be in service by mid-August. Due to certain confidentiality clauses in the sale agreement, we are not at liberty to discuss the sale amount. 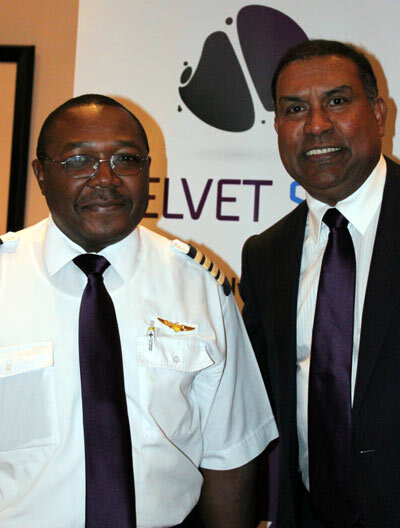 The operational management of Velvet Sky will remain unchanged; Velvet Sky's CEO Dhevan Pillay (26% shareholder) will retain his current position alongside current COO Gary Webb." When asked about the recently announced entry of the Santaco airline, Nthite said: "The projected market focus of the Airquarius brand differs from Velvet Sky's in that we plan to expand into Africa, while their routes seem to be largely regional". Excalibur Aerospace (Pty) Ltd, an aviation industry service provider, is owned by Excalibur Private Equity, and will be better positioned to add value to Velvet Sky than Macdonald Holdings, a steel and engineering group. Excalibur Private Equity has its head office in Houghton, Johannesburg. Velvet Sky originally planned on introducing Cape Town - Durban flights in July. Velvet Sky statement: "A huge thunderstorm grounded all airlines for 2 hours, compounded by a technical fault that we fixed in an hour. Cabin and flight crew are only allowed to operate for a certain number of hours and these clocks had run out by the time we were ready to fly. Safety first, so we called our standby-crew and then priority boarded families, women and children on the first flight out, turned the plane around and came back for the rest of our passengers. All Durban passengers were offered meal and accommodation vouchers. Sourcing alternate flights, or even planes, was a waste of time as universities have closed and all airlines were fully booked. We learn from these events to be better prepared for the future but there are some things that are simply out of our control. Please accept our sincerest apologies for the inconvenience caused and thanks for sticking with us." Velvet Sky released this message " ‎1 million hits on our website, and over 60 planes fully booked already has meant that our website and our call centers may have been slow and you may have struggled to get in touch with us respectively. For this we do apologise. In response we have nearly doubled our call center capabilities and have been assured by our technical team that our web servers are fit and ready for a million more hits." 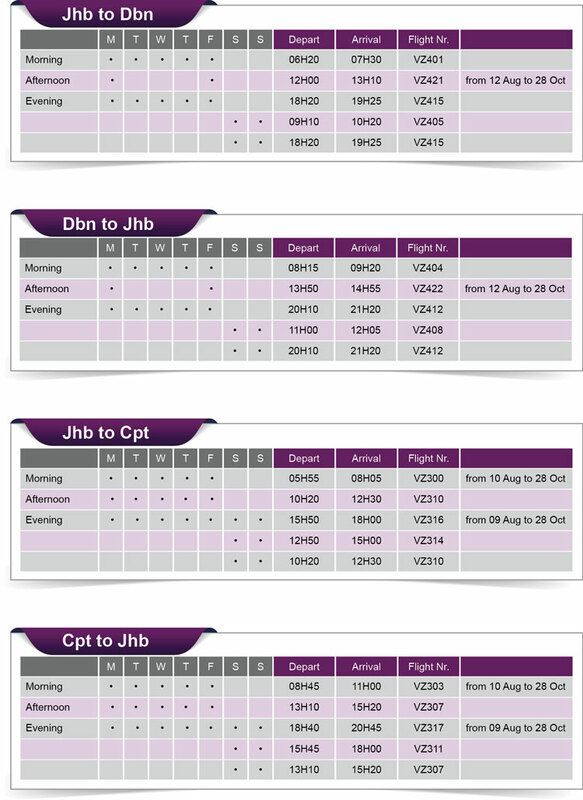 The inaugural Johannesburg to Cape Town flight is at 10h15 on the 24th March 2011. 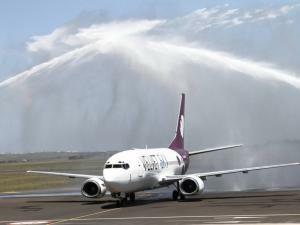 Velvet Sky's first flight VZ001 left Johannesburg OR Tambo International Airport, landing in Durban King Shaka International Airport at about 11h25am, with water cannons forming a ceremonial “water curtain” as the Boeing 737-300 aircraft taxied towards its terminal. There were 50 guests on board, including underprivileged students from the Ikusasa School of Cooking and Cecil Reddy (Velvet Sky chairman). At King Shaka Airport they were metinter alia by Fawzia Peer (an eThekwini councillor), Dhevan Pillay (Velvet Sky CEO), and media representatives. "Watching the plane in the Velvet Sky colours land was surreal. It was a dream come true and represents the culmination of more than three years of hard work," said Pillay. “It is historic and exciting to have the first Durban-based domestic airline and operating out of King Shaka Airport. It is clearly evident that our new airport has become a major catalyst for economic growth in KZN,” said Terence Delomoney (King Shaka Airport general manager). 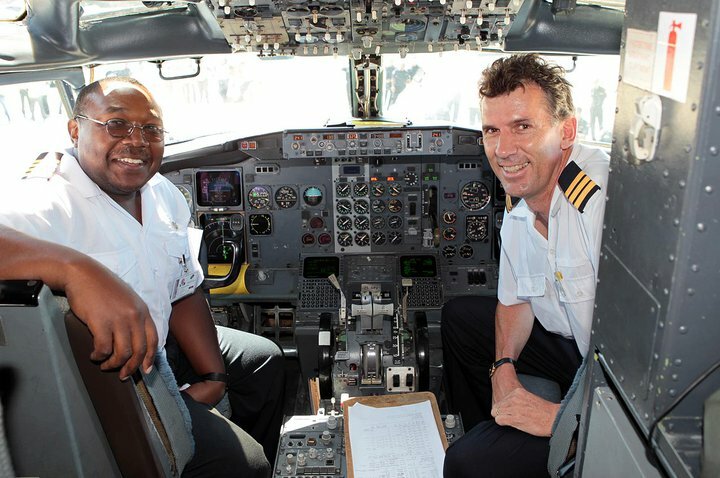 Here's a photo the pilots on Velvet Sky's inaugural flights - Captain Mwamba Chipaila and First Officer Hannes Van Rensburg. First Car Rental announces that it has partnered up with Velvet Sky. Says Melissa Storey, Executive Head: Strategy, Development & Marketing, “This is an exciting partnership for First Car Rental. We take our strategic alliances very seriously and adopt an approach that selects the best partners to grow with. We firmly believe in mutually beneficial relationships, focussing on each partner’s strengths, leveraging each opportunity that presents itself, and this will be the case with Velvet Sky who shares similar beliefs. This segment will assist us in combating seasonality, enabling us to manage and balance our fleet with less risk of high volume last minute up-fleeting or de-fleeting to try and match demand. Car rental is a cyclical business, and the purchasing as well as the planning thereof, is crucial to make this contribution model work. A low cost airline like Velvet Sky presents us with an opportunity to become the preferred car rental company of their daily direct consumer and corporate SME base, and inevitably, a stable, less seasonal domestic base. They present us with the ability to reach a captive, and more importantly, a targeted audience. We, on the other hand, can provide Velvet Sky with an existing customer base, all our valued customers, the majority of them having to fly to a local destination before they collect a car from us. We will do all in our power to expose the Velvet Sky product to them, and ensure that we enable loyal First customers to become loyal Velvet Sky customers. We have agreed to make all our channels available to our new exclusive airline partner so that Velvet Sky ha an automatic catapult into the market. We will create brand awareness for our new partner and support them with everything available to us, which includes actual flight bookings from our website and corporate booking tools. On a lighter note, First Car Rental and Velvet Sky share similarities in their logo palette they are both predominately purple and this will make the creative process of dual branding campaigns easy on the eye and a pleasure to create this is an advantage, but just the start of great things to come. In a press release Velvet Sky said: “Our corporate philosophy mandates cost saving through all levels of our operation. It was this mandate that dictated Durban, with its lowered operating costs away from the bustle of our competition, as the administrative hub of the business. Our research indicates that there is an increase in air commuting while people are starting to take more frequent but shorter holidays. These and other market related factors combine to create demand for another carrier." 30 Apr 2011. It's amusing that our porter didn't know where the check-in counter for Velvet Sky in Johannesburg was. 24 Apr 2011. Other than a check-in delay, things went smoothly in our first review of a Velvet Sky Cape Town - Johannesburg flight. Velvet Sky only allows minors who are 12 years or older to fly on their own. Younger children need to be accompanied by a guardian. Velvet Sky's directors are Ahmed Amod (a lawyer & legal representative for Aurora Empowerment Systems - Aurora's chairman is Jacob Zuma's nephew, Khulubuse Zuma), Stephen Nthite & Dhevan Pillay. The airline was flying Boeing 737-300s, with the first one being leased from then Safair parent Aergo (registration ZS-SPU, serial 24059, a former Safair Boeing 737-300, configured for 148 all economy seats), a Dublin-based a private leasing companythat opened an office in Johannesburg in February 2011. Velvet Sky airlines has plans to fly two more planes of the same type. They were originally reported to be obtaining Boeing 737-800s. The airline's fleet will be maintained by SAA Technical. In the rumour stages of development it was reported that the financial backers of the project decided not to divulge their names, for fear of reputational risk should the project not proceed. Now we know that a KwaZulu-Natal steel and engineering company company by the name of Macdonald Holdings is the majority owner of Velvet Sky. Macdonald Holdings in turn is (majority) owned by Cecil Reddy, who is also Chairman of Velvet Sky. The CEO of Velvet Sky is Devin Pillay, who is also a shareholder of Velvet Sky. Velvet Sky claims to be South Africa's first 100% Broad Based Black Economic Empowerment (BBBEE) airline company. Dhevan Pillay (CEO), Gary Webb (COO), Captain Paul Green (Director of flight operations), Kiran Reddy(marketing executive), Captain Marc Eriksen (Chief Pilot), Captain Neil Brough (Chief Training Captain) & Thertia Allegaert (Manager Cabin Services). It is reported that the Class 1 Air Service licence was issued in August 2009. Regulations, 1991, it is hereby notified for general infonnation that the appl ication detail of which appear in theappendix, will be considered by the Air Service Licensing Council. Representation in accordance with section 15 (3)of the Act No.1 15 of I 990in support of, or in position, an application, should reach the Air Service Licensing Council. Private Box X 193, Pretoria, 0001, within 21 days ofdate of the publication thereof. 4092. (C) Class I. (D) Type S 1 and S2. (E) Category AI. Amendment reffered to in section 14(2) (b) to (e). (A) Skyclass Aviation (Pty) Ltd. (B) Building 1, Rand Airport, Gemliston, Gauteng, Republic of South Africa, 1401. Velvet Sky airlines allow passengers to take 23kg with them and are charged per kilogram thereafter (check website for latest details). The first Boeing conducts a test flight for the Captain and Cabin Crew, and is accepted from Aergo by Velvet Sky. Bookings are opened with a flight special at midday on the 18th March 2011. They initially didn't let on as to the details of the special, so that competitors couldn't undercut them, but at opening there were Johannesburg - Durban flights for R201 and Johannesburg - Cape Town flights for R401. Velvet Sky's first press conference at Durban Country Club. Velvet Sky Aviation is registered as a company. We first noticed Velvet Sky when we them advertising positions on the website, most of which were in Durban (the last time we heard of a new airline based in Durban was Airtime Airlines, an idea which didn't last long, happily Velvet Sky have got far further than they ever did). 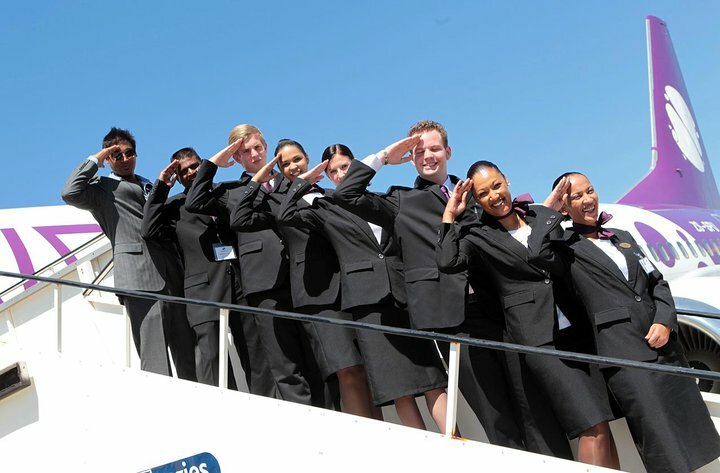 In addition to the Airline's website at www.velvetsky.co.za, following urls have also been purchased: flyvelvetsky.co.za and flyvelvetsky.com. FlyVelvetSky.com was registered on 2 Feb 2009, indicating the idea had been perculating for a while. The South African websites were registered by iSPACE (PTY) LTD. The new airline will offer competitive salaries and an excellent work environment. Most positions will be based in Durban. Head office is located adjacent to Gateway. We invite you to register and upload your CV. You will be contacted if your details match our requirements. If you see a position listed that is of particular interest to you, then please apply for that position. Preference will be given to candidates with relevant experience." Velvet Sky airline has nothing to do with "Velvet Sky", the stage name of an American professional wrestler.